I know a cat named Happy Boy. Happy Boy lives in an impressive house built vertically into the Berkeley hills and overlooking the East Bay. Happy Boy is black and white and very fluffy, with a pink nose and brilliant green eyes. In spite of his good looks, Happy Boy is not the cuddliest soul, preferring to keep his distance, staring cooly at his guests, turning on his pink toe pads and making a run for it when a feliphile tries to pet his soft coat. Perhaps “Dour Boy” would be a more appropriate name. Happy Boy the cat bears no relation to Happy Boy Farms; though, luckily for us, he and organic farm owner Greg have mutual friends in Jay’s folks. While I can’t vouch for Greg’s cuddliness, I can attest to his generosity and mad vegetable-growing skills. When we visited Corralitos last weekend, Greg had bestowed upon Jay’s folks full cases of exquisite vegetables: tender baby greens, variegated cherry tomatoes, summer squash in all shapes and colors, freshly-dug potatoes, rotund Nantes carrots, red and white spring onions, and plump ears of yellow corn. I had never tasted corn and summer squash more sweet; seasoned simply with olive oil, salt and pepper and grilled, they tasted almost like dessert, and I could live on his potatoes’ creamy golden flesh flavored with butter and salt. When Jay’s folks sent us home with a shopping bag full of produce, I was inspired to create a summer version of the Quinoa, Kale and Sweet Potato Salad that we practically lived on last December, perhaps as an antidote to too much pie. 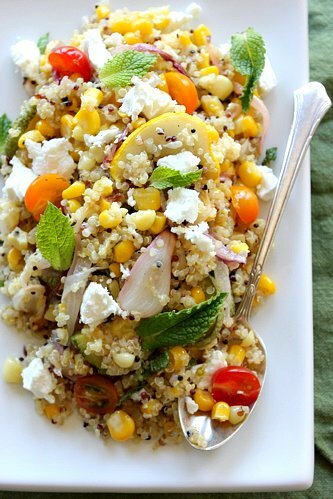 Inspired by a recipe in Gourmet, I toss roasted corn kernels with fluffy quinoa and slivered mint, and add more vegetables, and a bit of goat cheese, to turn the side dish into lunch. 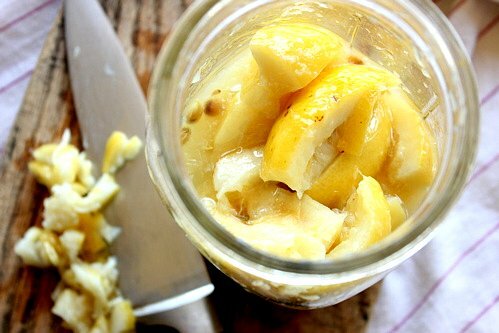 I also add a bit of preserved lemon, which is a cinch to make following this video from Chowhound (though you can omit it if you don’t wish to wait 2 weeks to make this). 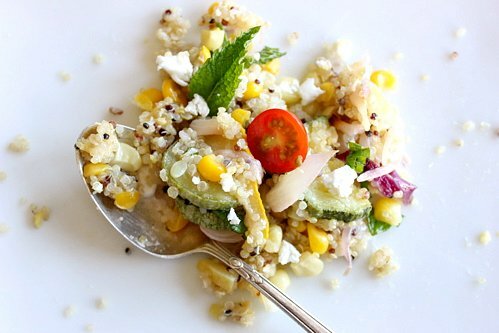 Corn and quinoa, both New-World plants, go together exceedingly well, while the lemon and mint give the dish an unexpected, Moroccan flair. Sweet vegetables obliterate any lingering bitterness from the quinoa, though a quick soak prior to cooking removes the bitter coating, letting the rich nuttiness of the grain come through. 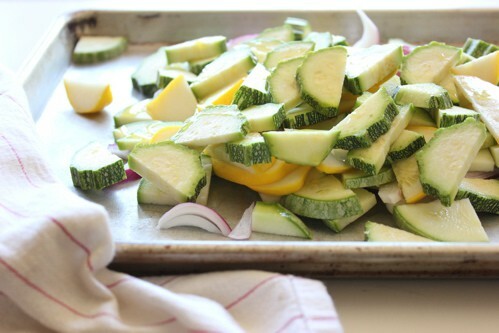 Serve this as a side dish to grilled meats, or eat alone as a light lunch. 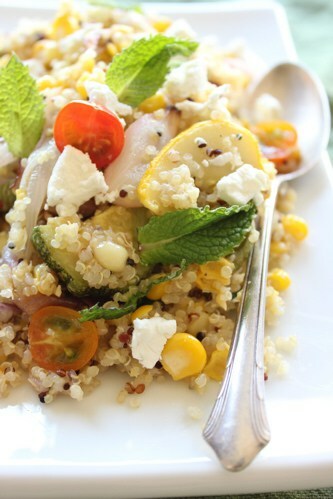 This quinoa keeps well and travels better; it would make a welcome addition to any potluck (4th of July BBQ?) or picnic. 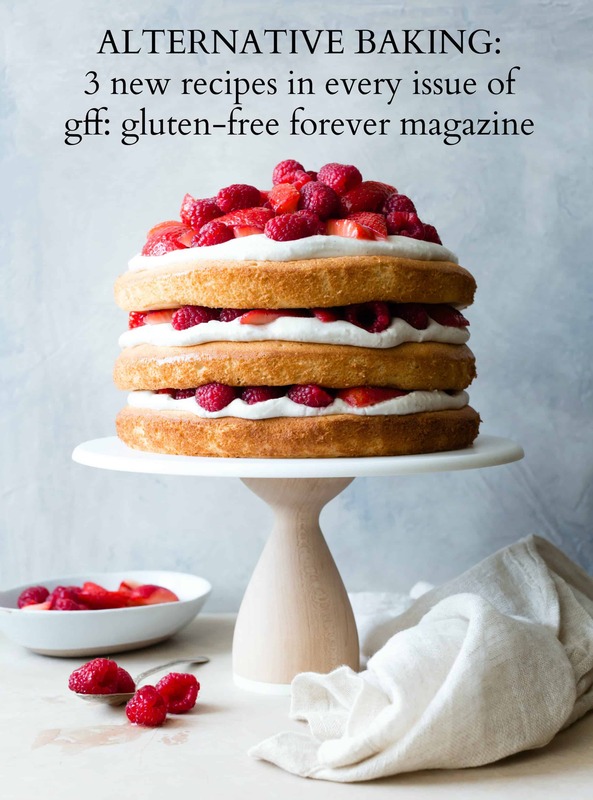 And it’s of course gluten-free and vegan (if you omit the cheese). If you’re a grill-master, this dish would be stellar with the onion, squash and corn grilled instead of roasted. Either way, it’s guaranteed to turn you and your guests into happy boys and girls. 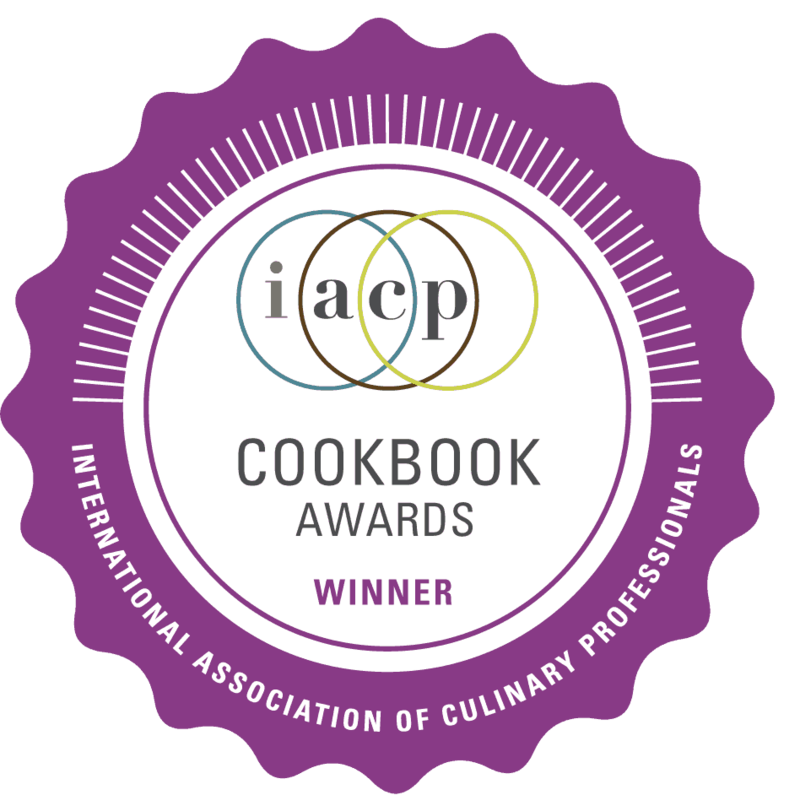 I jumped at the chance to use my preserved lemon in this dish, which can be found in the Middle-Eastern section of well-stocked grocers, and is a snap to make following this quick video from Chowhound. Don’t fret if you don’t have any; add a grating of lemon zest and a little extra lemon juice and salt. I like this dish best at room temperature, when freshly assembled, but it keeps well in the fridge for up to 3 days. 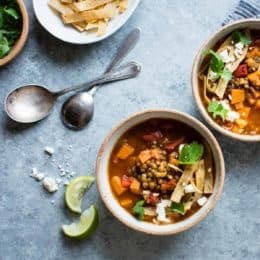 Vegans will be happy to know that this dish is also excellent without the goat cheese. 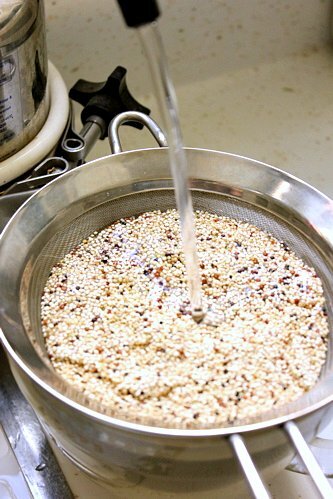 Place the quinoa in a very fine-mesh strainer and place the strainer in a bowl or large measuring cup. Cover with cool water and let soak for 5-10 minutes. Drain the quinoa, rinse it again, drain well and place in a large saucepan with 2 1/4 cups water, 1/2 teaspoon salt and 1 tablespoon of the olive oil. Bring to a simmer over medium-high heat, then reduce the flame to low and cook, covered, until the quinoa has absorbed all the water and is tender to the bite. 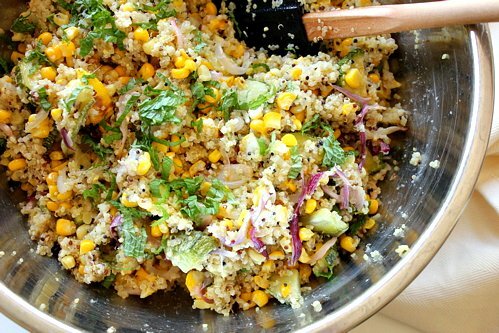 Let the quinoa sit, off-heat, for 10 minutes, then remove the lid and fluff with a fork and leave to cool slightly. Meanwhile, position racks in the upper and lower thirds of the oven and preheat to 425ºF. Wash the onions and peel off any papery outer layers. 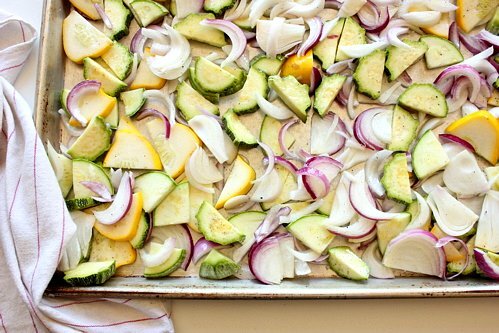 Cut off the greens and discard (or save to use in stock). Cut the onion in half through the root, then in half crosswise. Slice lengthwise into 1/4″ thick pieces. 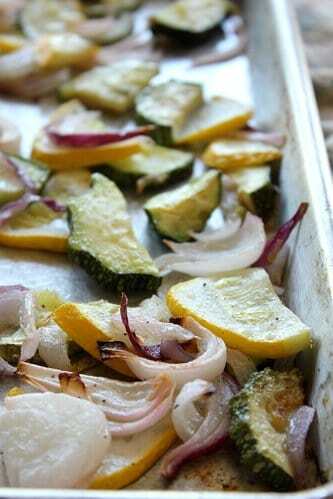 Place the summer squash and onions on a rimmed baking sheet and drizzle with2 tablespoons of olive oiland sprinkle with 1/4 teaspoon salt and a few grindings of black pepper. Toss to coat, then spread into a single layer. Roast in the oven until tender and beginning to color, 15-20 minutes, turning if necessary. Let cool slightly. Meanwhile, shuck the corn and rub off the silk. 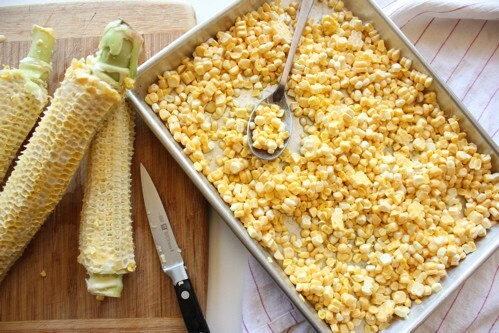 Hold the corn upright in a wide, shallow bowl and use a sharp knife to cut off the kernels. (See photo here). Toss the kernels with the remaining 1 tablespoon of olive oil and a big pinch of salt. 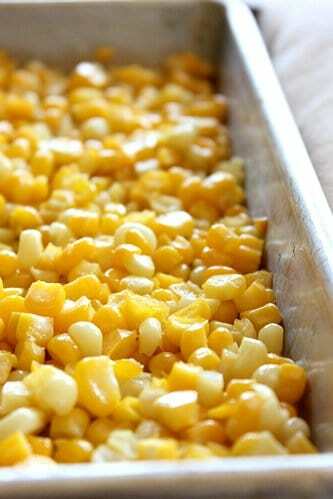 Spread on a small rimmed baking sheet and bake until crisp-tender and beginning to color, 8-10 minutes. Let cool slightly. 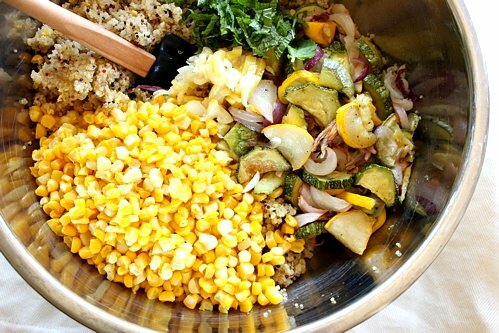 In a very large bowl, combine the cooled quinoa, squash, onions and corn. Toss with the lemon juice, mint, preserved lemon and tomatoes. Sprinkle over the goat cheese, and taste for seasoning, adding more lemon juice or salt if needed. Serve warm, at room temperature, or chilled. The quinoa will keep, refrigerated, for a few days. I take it you're using the non processed (pre-rinsed) quinoa and that's why you are soaking and rinsing it before cooking. Where did you pick up the multicolored quinoa btw? Thanks – I had you in mind! I didn't know you could buy the pre-rinsed stuff – good to know! I get the multi-colored quinoa from Rainbow. It's actually cheaper than the white quinoa. Need to tell you something.. I live in Slovenia and here we have hectares of corn plants and almost everything is for livestock. So if you feel to eat corn you go to market and buy corn in tins or cornflakes or something like that. Once a year some people bake or cook whole ears of corn for some picnic and that is it! People just do not know what to do with fresh ears of corn or maybe is in our mentality that corn is for livestock! And I also did not know until I found you blog! 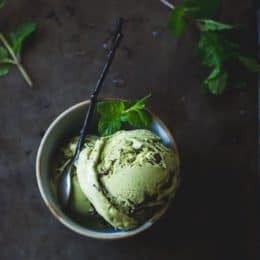 This is second recipe that I looked and I am impressed, excited, thrilled :D I can't wait to try both of them and others that I did not looked at yet . Today will try Cornbread with Sweet Corn, Cherry Tomatoes and Sheep's Cheese… So what I wanted to say is: Thank you for showing me how to use fresh corn! Also.. Love your pictures, love your type of writing! I asked a friend, who has corn for livestock, to give me some ears of corn and I did your Cornbread with Sweet Corn and vegetables, your Quinoa with Roasted Corn and Zucchini and Corn soup. It was delicious! My father LOVED Cornbread :D So I think that that kind of corn is good for cousine. I believe the thing is that fresh ears of corn are good to cook and eat for maybe 3 weeks in August, so it is more applicable if they dry it and then give it to livestock for a whole year. 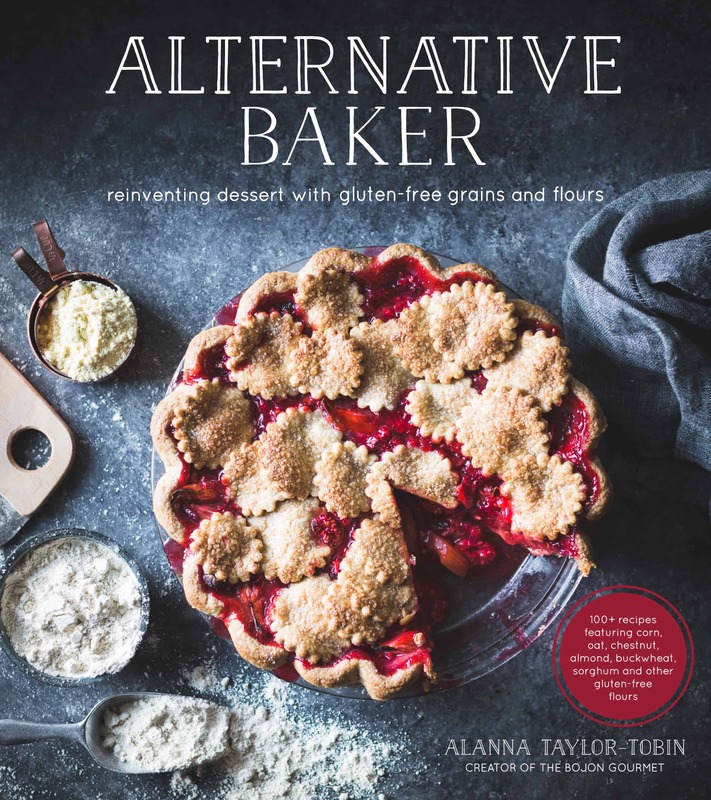 So maybe i would not be so excited about recipe if I would read it in December, but right now is the time for a corn and because no one ever bake something from a fresh corn that very impressed me. I do not even know where I found your blog, but I am happy that I did. 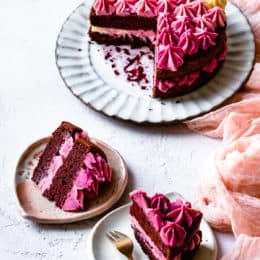 There are so much receipes that I saw and want to try and so many that I did not discovered yet.